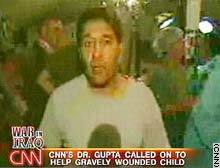 CNN's Dr Sanjay Gupta reporting by videophone from the 'Devil Docs' field hospital. CNN's Dr. Sanjay Gupta reports on round-the-clock operations at the Devil Docs field hospital. SOUTH CENTRAL IRAQ (CNN) -- CNN Medical Correspondent Sanjay Gupta, a trained neurosurgeon, performed emergency brain surgery at a U.S. field hospital in south central Iraq in an attempt to save the life of a wounded Iraqi boy. Gupta, who is traveling with a team of U.S. Navy doctors known as the "Devil Docs", was called upon to operate on the boy who was suffering from head wounds caused by a bullet or shrapnel during an incident at a U.S. Marine checkpoint. Although the boy, who had several other serious injuries, later died, doctors operating with the team said the brain surgery had at least given him a small chance of survival. "Without his help, there would have been no chance," Dr. Rob Hinks, the U.S. commander in charge of the tent hospital told CNN. Speaking by videophone Thursday to CNN anchor Bill Hemmer, Gupta said he felt a "medical moral obligation" to help. No other trained neurosurgeons were available when the injured child arrived by helicopter for treatment. "It was not an elective operation," Gupta said. When the boy was brought in his injuries were such that he "probably had minutes to live" Gupta added. Military officials say the tent hospital treats anyone in need -- coalition soldier, civilian, or Iraqi soldier. The boy's mother, who was also injured in the checkpoint incident was also treated at the facility and survived. Two others died in the shooting, which, according to the military, occurred when a taxicab passed through a U.S. Marine checkpoint south of Baghdad without stopping, prompting Marines to open fire.